Choreographer Annie-B Parson and her company Big Dance Theater have frequently used existing narratives and texts as bases for their varied repertory. 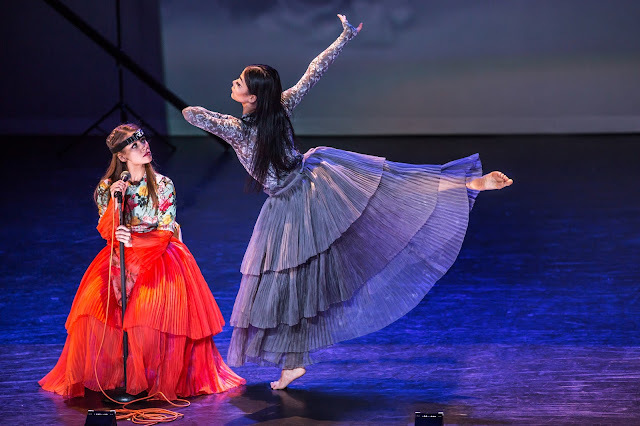 In I used to love you, a premiere for Martha Graham Dance Company at the Joyce Theater, Parson has succeeded in acknowledging an oddity of Graham's repertory while creating an intriguing new entry. And the Graham company, under Janet Eilber's direction, continues to evolve smartly while embracing its rich history. Parson conducted a "conversation" with Graham in I used to love you, using a film of Graham's 1941 comic dance drama Punch and Judy as a starting point. Parson skillfully deploys her wry wit and conceptual curiosity, enfolding scratchy clips of the original with other footage (video by Jeff Larson) to create something completely new. The Greek chorus, a standard feature in many Graham dances, comprises Anne O'Donnell, Leslie Andrea Williams, and Laurel Dalley Smith. They're the first thing we see—posed on the apron, strikingly costumed in Oana Botez's beautiful, hot-hued, pleated crinoline and floral dresses, a nod to Graham's focus on couture as an important production element. They each sit on a white rolling office task chair and hold mics with color-coordinated cords, fan kick their legs, and roll on their chairs casually while a drum roll (music by Tei Blow) sounds, raising the level of anticipation. Ben Schultz then proceeds to steal Punch's affection. The two men strip off their shirts and perform a muscular acrobatic duet on the cot. There's a blackout, and we're informed that it represents the place where the original film broke. A stunning video of a giant moon appears on the backdrop. Judy dances a passionate solo filled with sweeping limbs and taut lines (Parson reinterpreted the original Graham choreography), and her face appears large onscreen. The kneeling chorus members pull their skirts over their heads and rock in a sort of physical keening as Judy hinges to the floor on her back. 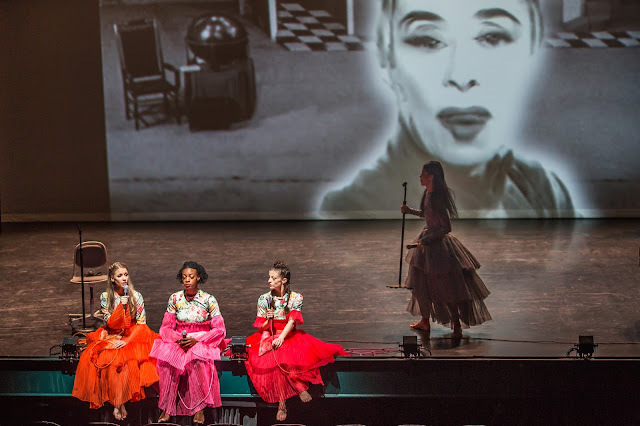 Martha's projected face looms over the drama, as the chorus moves to sit on the edge of the stage, their legs dangling. The February 14 program included works by Graham: Dark Meadow Suite (1946), an exercise in clear shapes and structures; the solo Ekstasis (1933), a snaky solo for PeiJu Chien-Pott; the bizarre, self-mocking Maple Leaf Rag (1990), plus Woodland by Pontus Lidberg, a work showing off his elegant, balletic phrasing.